Holland America Line have announced that upcoming cruise ship ms Koningsdam is to sail from Amsterdam during the summer of 2016. In summer 2016, Holland America Line’s newest ship, ms Koningsdam, will debut a series of northern Europe and Baltic cruises as part of the premium line’s robust Europe season that features seven ships sailing throughout the region. Koningsdam’s summer itineraries and all of Holland America Line’s 2016 summer Europe sailings will be available for booking in early February. Following a series of previously announced seven- and 12-day Premiere Sailings from Feb. 20 through April in the Mediterranean, the ship will reposition from Civitavecchia (Rome), Italy, to its summer homeport ofAmsterdam, the Netherlands. Koningsdam will then go on to sail roundtrip Amsterdam itineraries to Norway, the Baltic and Iceland, where breathtaking vistas and grand fjords await. Koningsdam’s 13-day repositioning cruise from the Med departs May 9 and explores 10 ports in Spain,Gibraltar, Portugal, France, Belgium and the Netherlands before ending with an overnight at Amsterdam. Once at Amsterdam, the ship will begin exciting seven- and 14-day cruises to Norway that showcase the country’s majestic scenery and quaint landscapes. A seven-day itinerary in May, July and August calls at Flam, Stavanger, Kristiansand and Oslo, with scenic cruising in Sognefjord and Oslofjord. Another seven-day itinerary in June and July calls at Eidfjord, Alesund, Geiranger and Bergen, with scenic cruising in Hardangerfjord and Geirangerfjord. A seven-day voyage in August calls at Bergen, Hellesylt, Geiranger, Alesund and Eidfjord, with Hardangerfjord and Geirangerfjord scenic cruising. A longer 14-day Norwegian exploration departs May 29 and July 17, and crosses the Arctic Circle while calling at eight ports in Norway. Guests also will enjoy memorable scenic cruising in Hardangerfjord, Geirangerfjord, Trondheimsfjord, the North Cape and Sognefjord. Travelers looking to visit the British Isles and Iceland can embark Koningsdam Aug. 14 for a cruise to Newcastleupon Tyne, England; South Queensferry (Edinburgh) and Invergordon (Inverness), Scotland; Reykjavik(overnight), Isafjordur and Akuruyri, Iceland; and Alesund and Bergen, Norway. The Baltic awaits Koningsdam’s guests on two 14-day itineraries in June and September, also sailing roundtrip from Amsterdam. The ship calls at the most sought-after ports in the region, with visits to Copenhagen, Denmark; Warnemunde (Berlin) and Kiel (Hamburg), Germany; Tallinn, Estonia; St. Petersburg (overnight),Russia; Helsinki, Finland; and Stockholm and Gothenburg, Sweden. At the end on the season, Koningsdam sails from Amsterdam to Civitavecchia on a 12-day journey that visitsEngland, Gibraltar, Portugal and four ports in Spain. On Oct. 24 the ship repositions to Fort Lauderdale, Fla., on a 14-day voyage that crosses the Atlantic following calls at Alicante, Malaga (Granada) and Huelva (Seville),Spain; and Funchal, Madeira. As previously announced, Koningsdam’s seven-day Premier Voyage sails roundtrip from Civitavecchia departing Feb. 20 to Dubrovnik, Croatia; Kerkira (Corfu) and Katakolon (Olympia), Greece; and Naples, Italy. The 12-day Premiere Sailings that follow are two alternating itineraries roundtrip from Civitavecchia. The “Greek & Turkish Treasures” itinerary calls at Katakolon, Piraeus (Athens), Rhodes and Crete, Greece; Istanbul(overnight) and Kusadasi (Ephesus), Turkey; and Naples, Italy. This itinerary also will be offered Sept. 30, in addition to the Premiere spring departures. The “Mediterranean Mosaic” itinerary spends 12 days visiting Naples, Italy; Palermo, Sicily; Cagliari, Sardinia;Gibraltar, British Territory; and Cadiz, Malaga, Cartagena and Barcelona (overnight), Spain, sailing roundtrip from Civitavecchia. In addition to the Premiere spring departures, this itinerary also will depart Oct 12. The 99,500 ton ms Koningsdam will be a new class vessel for Holland America Line and is scheduled to be delivered to the cruise line by Italian shipbuilder Fincantieri in February 2016. Holland America Line has revealed the name and some details of the third Pinnacle class cruise ship which will join the fleet in 2021. The newest Holland America cruise ship named Nieuw Statendam is suffering from major power loss and was adrift. 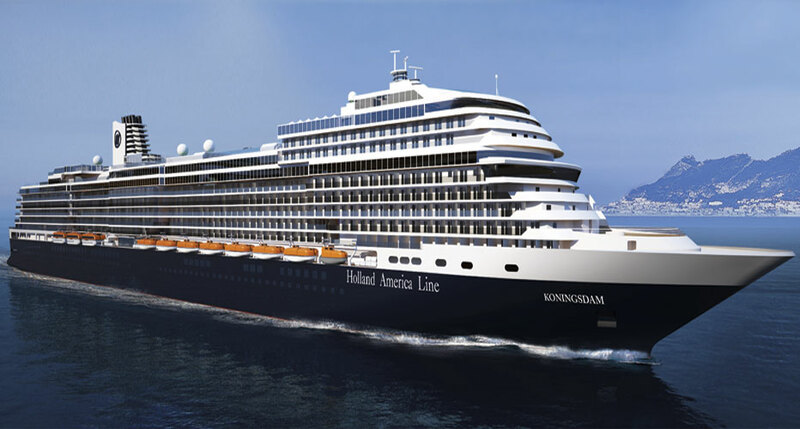 Holland America Line has just 30 days until Nieuw Statendam is delivered and becomes the newest ship in the fleet.